Michael J. Heckenberger’s research has shown that the Amazon once supported settlements of thousands of people who lived in villages connected by an ancient version of interstates and interspersed with fields, moats and bridges. Heckenberger and his colleagues worked hand-in-hand with members of an indigenous Amazonian tribe to identify and map out two large ancient settlements now overgrown by jungle. Each settlement in the remote region of north central Brazil was occupied from as early as A.D. 800 until about 1600 and was composed of eight to 12 villages connected with roads and dotted with causeways, plazas and other structures or earthworks. 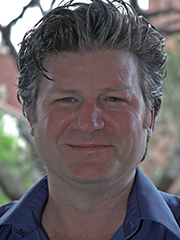 By integrating conventional archaeological practices with satellite mapping techniques, and by tapping the current knowledge and practices of descendants of the settlements’ ancient inhabitants, Heckenberger has shed light on a region considered something of an archaeological black hole – despite a size nearly equal to that of the continental United States. “This place had an economy that supported a large number of people in multiple large villages integrated across the region into a grid-like system,” says Heckenberger. Since he began working with the Kuikuro in 1991, Heckenberger has lived almost two full years with the tribe.